All India Jat Aarakshan Sangharsh Samiti (AIJASS) president, Yashpal Malik, Sunday, recorded his statement in the sedition case registered against him at Jind City police station. All India Jat Aarakshan Sangharsh Samiti (AIJASS) president, Yashpal Malik, Sunday, recorded his statement in the sedition case registered against him at Jind City police station. Also, the organisation lifted its dharnas, demanding reservation in jobs and educational institutes, by Sunday afternoon from 15 districts of Haryana, as decided on Saturday at New Delhi in a meeting with Haryana government. On May 27, that the Jind police had registered a sedition case against Malik and 125 other persons for allegedly threatening peace and communal harmony in the state by instigating people to launch a fresh Jat reservation quota agitation. However, Malik was not arrested and on June 16, he was issued notice to join investigation within a week. SHO of Jind City police station, Sub-Inspector Jagbir Singh confirmed, “Malik has recorded his statement today. He has said that he has not given any such speech or done anything for which sedition case should be registered against him.” When contacted Malik informed, “I have told police that proper investigation should be done of the facts and the compact disc (CD) should be got examined from forensic laboratory. If I am found guilty, I’ll face the consequences. 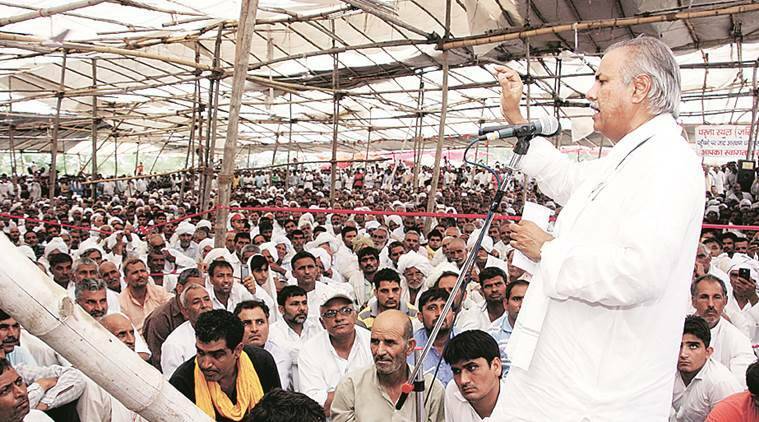 As per me, I have done nothing wrong and all our members were sitting on peaceful dharnas.” Malik said that his organisation members lifted dharnas across Haryana to give time to the government to act on their 10 demands by August 31.